Preliminary figures show that Lane dropped the fourth-highest amount of rain for a hurricane to hit the United States since 1950. HONOLULU — A once-powerful hurricane twisted and drifted away from Hawaii, leaving behind heavily saturated ground on the Big Island and many residents on other islands relieved it didn't wreak more havoc. Firefighters on the Big Island rescued 39 people from floodwaters Friday through early Saturday as the island grappled with the nearly 4 feet of rain from Tropical Storm Lane, formerly Hurricane Lane, dumped precipitation on the eastern part of the island over the course of three days. Brian Daniels, owner of Moku Hawaii, a surf shop, said in the days leading up to the hurricane, he left the Weather Channel on almost constantly. "I didn't sleep for three nights thinking about it," Daniels said of the hurricane, adding that he made "half a dozen trips to Home Depot and Costco and Sam's Club just to get prepared." He said he was relieved when the storm began to break apart, but still wanted to ensure he was prepared. "They're still expecting a lot of rain, but I think we've worked in worse conditions than what we're gonna see today," Daniels said on Sunday. The National Weather Service has canceled all storm warnings for the state. The storm's outer bands dumped as much as 45 inches on the mostly rural Big Island, measurements showed. 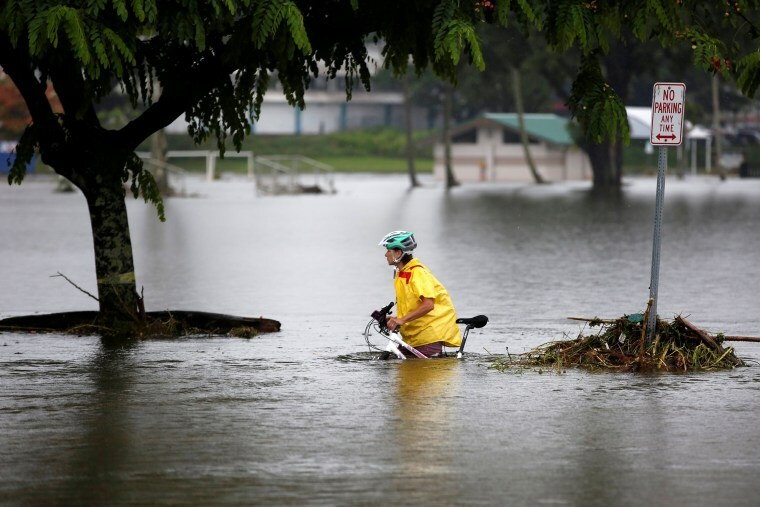 The main town of Hilo, population 43,000, was flooded Friday with waist-high water. "It was almost biblical proportions," said Kai Kahele, a state senator who represents Hilo. The ground was soggy on Saturday, he said, and it was still raining. But Hilo is accustomed to rain, he noted. And the Wailuku River, which raged with runoff, has a name that means "destructive water" in Hawaiian. Native Hawaiians who have lived in the area for hundreds of years know how dangerous the river can be, Kahele said. "We're going to get nailed one time, and people are going to not listen," Palumbo said, "exactly like 'The Boy Who Cried Wolf.'"